When you think of places to go fatbiking in, Lapland is probably not the first place that comes to mind. 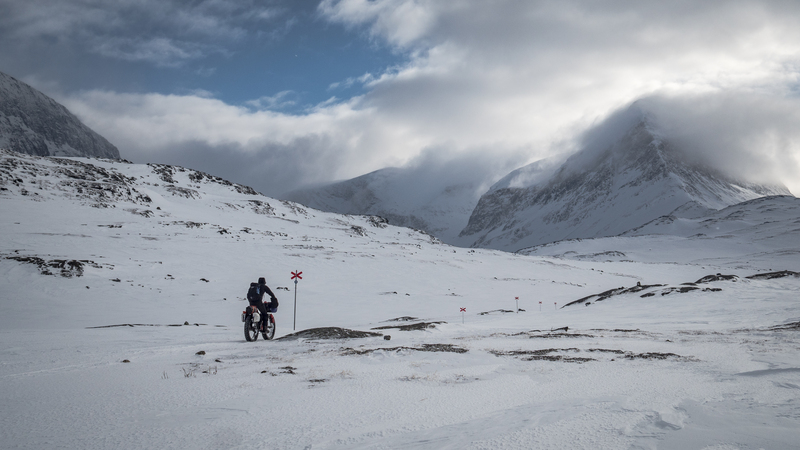 But for Huw Oliver and his partner Annie, Lapland was the perfect destination for a fatbiking adventure. 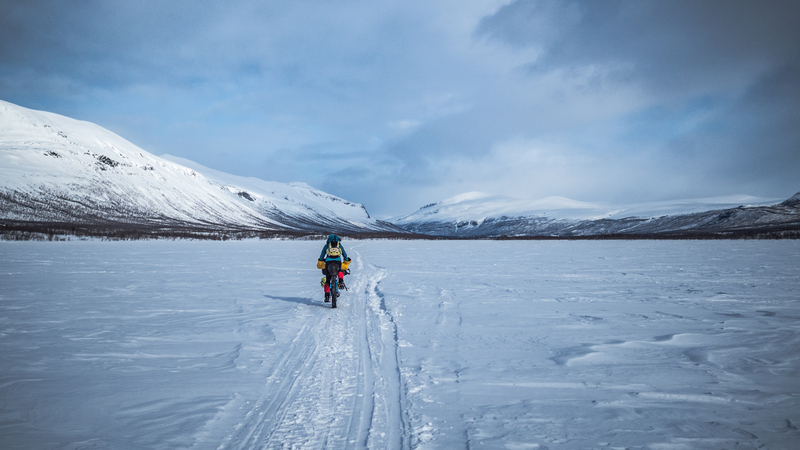 We spoke to Huw to hear more about his story “Lemonade in Lapland” and to find out about his motivations for undertaking an expedition in such extreme conditions. What drew you to the north of Sweden, over other – slightly more temperate – climates? I think that, living in a very temperate, mild climate here in the UK, we’re drawn to extremes. You either look south the Mediterranean, or you look north! Scottish outdoor culture has a lot of strong Scandinavian influences, whether it’s the cross-country skiing that’s still strong in Aberdeenshire, or the herd of reindeer that were brought over from Sweden to the Cairngorms in the 60’s. We were already keen to visit that part of the world, but the lure of a good adventure in the ‘proper’ winter of the north sealed the deal. So many Scandinavians clearly enjoy and thrive in the climate up there, that we wanted to know what all the fuss was about! How did you get into fatbiking and what about it do you enjoy? You and Annie have been on a couple of expeditions together. How important is it for you to share the experiences together? As important as it is for us to share places and experiences with each other, we also enjoy taking time out to be alone from time to time. We might ride separately for half the day, so that we don’t get sick of each other but also because it’s important to have a bit of space, to see a place on your own terms. We both value solo trips highly, too. Some of my best memories of adventures on my bike are from times when I was alone, and there are no photos to show either. There’s something special in those experiences that belong only to me, I think. You followed quite a well-known trail across the Swedish/ Norwegian border – can you tell us a bit more about that? The trail we followed in places is called the Kungsldeden, or ‘King’s Trail’. It runs between the Sami villages of Abisko and Kvikkjokk in Swedish Lapland, and is travelled in both summer and winter. The route climbs from Tornetrask lake into the hills and follows enormous glacial valleys south; if you’ve ever been hiking in the Cairngorms then the landscape would feel familiar, although everything felt three or four times the size. Did you meet any other people on your trip, doing a similar thing to you? We met plenty of friendly people, but no-one on bikes! We had a huge amount of admiration for the Swedish people that we met in the mountains, everyone was curious about our bikes, but they were universally supportive of other people outside in the mountains. Back at home, the majority of people said we were mad, or masochistic, or that it was crazy, or some other clichéd negativity like that. 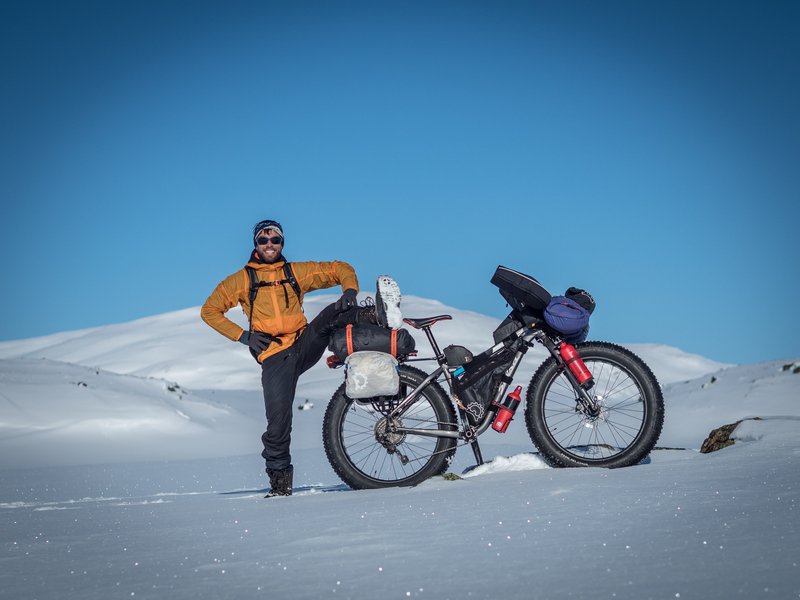 In Sweden, people were bemused at times, until they realised that the bikes were able to travel just as fast as skis, but overall they thought it was a fantastic idea for an adventure. You were camping in temperatures of up to -20C, which must have been pretty demanding. How did you stay warm and safe in those harsh conditions? There are mountain huts which are absolutely incredible, but they were well outside our budget. We were looking forward to the chance to improve our winter camping skills, anyway! We’re both used to winter camping in Scotland, but it was certainly different in Lapland. Staying dry and staying well fed are both pretty key to staying comfortable in cold conditions, and luckily the climate was significantly drier than the winters we’re used to. That made it easier to keep the insulation in our clothes and sleeping bags dry and effective, although we did have to sleep inside ‘vapour barrier’ liners in our sleeping bags, which prevent water vapour produced by your body from travelling into the down insulation, condensing and then freezing. We did the same with barrier socks to prevent our boots from getting wet from sweaty feet. We made sure to eat well too — although food is heavy, I’d rather carry the weight than the alternative. Overall, we were fairly comfortable, and the temperatures were at around -20C for several nights. The low point of every day was getting out of the sleeping bag to get the stove on (we took turns), and putting on freezing cold boots! You mentioned that the cold had an instant effect on your mindset when you were out there. Were you expecting to struggle as much - and as quickly - as you did? Yes and no. We both know from experiences of Scottish winters in the hills that the cold can turn things very quickly, and it’s how you learn from it that matters. We knew that we were relatively inexperienced in those kinds of conditions, and that we would need to be alert to our shortcomings and willing to learn quickly. We changed the things that weren’t working for us, and soon enough we felt fairly comfortable in our limitations. We never did manage to be zen about the cold feet in the mornings though. It doesn’t matter how warm you are, put your feet in boots that have been at -20C all night, and they will get cold! It often took an hour or so to get them warmed up after we set off. How much do you think you and Annie help each other to get through these difficult times on a trip? That depends. Sometimes, the other person becomes the target of all that frustration. I’ve certainly done it before, and I know when Annie is doing it to me. At those times, it helps enormously to be travelling with someone you know well, that you’ve been through difficult periods with before. We each know how to read the other, when to try to help or offer a snack, and when to just keep trucking on. When we do sometimes take the frustration out on each other, it’s easy to forget it later on. It’s a lot easier to suffer together than it is to do it alone though. How would you say being outdoors and undertaking these trips has impacted your life? I think the benefits of doing these things are the same ones that I’m trying to communicate to the kids I meet at work; they’re real, and they’re long lasting. It doesn’t matter whether you’re going for a day out on the hill or a month-long expedition, by pushing ourselves a little further than we have before, we come to realise that we’re capable of more than we think, and we grow as people. It might sound cheesy, but it’s true, and I see it every day at work. What advice would you have, for someone who wants to undertake an expedition or expeditions like you’ve done? Find something that catches your imagination. Once the spark is there, the rest will fall into place with a little determination and imagination, one way or another. It might be a photo that caught your eye, and exotic place name or something more personal, but you’ll know when you find something that draws you deeper, and if you follow it you’ll likely find an adventure of your own. To read more about Huw and Annie’s trip to Lapland, click here.